Sometimes subscribers to kalmstrom.com Solutions use more than one product, and often they can enhance each other. Here I will explain how the add-on HelpDesk OSP for Outlook and SharePoint can help you to get more out of Kanban Task Manager for SharePoint. 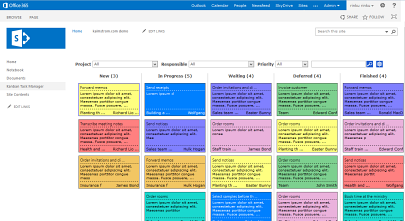 Kanban Task Manager is a virtual kanban board that works in Outlook and SharePoint. The kanban tasks are standard Outlook or SharePoint tasks, but we have added dropdowns for selection of tags, for example project and phase. This way the tasks can be categorized, and you can drag and drop them between phases as work proceeds. Sometimes you get information in an e-mail that you would like to save in a task. To get it to the two Outlook versions of Kanban Task Manager is easy, because you only have to drag the e-mail to the Kanban Task Manager Outlook folder. If you are using only the SharePoint version, it gets a bit more complicated. You need a way to convert the e-mail to a SharePoint list item – and kalmstrom.com Business Solutions has such a tool for you. The kalmstrom.com Outlook add-on HelpDesk OSP converts e-mails into SharePoint list items, manually or automatically. As HelpDesk OSP can place the converted e-mails in any SharePoint list you can also use this add-on for conversion into tasks on the virtual kanban board created in SharePoint by Kanban Task Manager. Should you want to create a new, blank kanban task from Outlook is that also possible with HelpDesk OSP. By default the Kanban Task Manager SharePoint dropdowns don't require a value, so therefore you must select those in the task you create from an e-mail with HelpDesk OSP before it can be displayed on the kanban board in SharePoint. This is acceptable if you convert an e-mail manually now and then, but if you use automatic conversion of all incoming e-mails to an Outlook folder it does not work. Then you need a way to see what new tasks have not been properly tagged, and you want to see that directly on the kanban board. In the Kanban Task Manager Settings, add a new phase "Not assigned" and set it to the first in the phase sequence. Also add "Not assigned" values for the other dropdowns, but as they are sorted automatically you have to call the value "1 Not Assigned" to make sure it is placed first in the dropdown list. If you now also change the Kanban Task Manager task list setting so that a dropdown value is required, this first "Not assigned" value will be selected – because the first value will be selected automatically. In the demos below I am showing how to make that change in the list settings for both SharePoint 2010 and SharePoint 2013. Now each new task that has been created from an e-mail with HelpDesk OSP will be placed in the "Not Assigned" phase on the kanban board, and from there you can change the tag values when it is convenient. Are you using two kalmstrom.com Solutions together in some smart way? Please tell us, so that we can spread the idea to other subscribers.